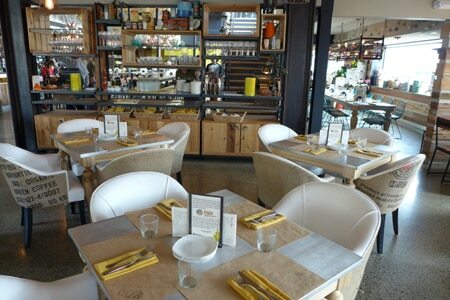 Eye-popping design, dynamic food and a good locals' scene in Del Mar. : Owner Tracy Borkum stands as the reigning queen of San Diego's casual social dining scene. Thanks to her keen eye for detail, her friendly, professional staff, an affordable wine program and eye-popping set design, CUCINA enoteca Del Mar is packed nightly. To enter the restaurant you must walk through the affiliated retail wine shop. The massive 9,000-square-foot eatery is a feast for the senses with its communal tables under faux-antler chandeliers and playful art like strings of plastic horses hanging by the stairs. Bewitched by that burlap chair, wire pendant lamp or vintage milk crate? Practically everything you see can be purchased. The bar scene pulses both downstairs and on the upstairs deck, where guests can cozy up in swing chairs or in a lounge-y setting. On the airy main level there is also a dining counter facing one of the kitchen areas. The menu mimics that of Borkum’s flagship Cucina Urbana, but chef de cuisine Andrew Bachelier adds his personal touch. Herbs and produce are sourced from planters placed upstairs and near the entrance. Pass on the grilled octopus in favor of the lemon roasted beets or mini Mason jars of chicken liver pâté or creamy burrata and roasted garlic confit. Move on to the squid ink gnocchi or bucatini with guanciale, burnt cabbage leaf, tomato, chili, pecorino and a poached egg. Creative pizzas run the gamut from goat cheese and squash blossoms to pancetta and Brussels sprouts leaves. The burger beefs up with a braised short rib on top, served with requisite truffle fries. Steak, roasted chicken and baked Arctic char round out the entrées. Desserts tempt with options like chocolate budino and brûléed banana panna cotta. The wine list includes “vintage gems” like a 1988 Tenuta dell’ Ornellaia, while the beers highlight selections from San Diego and Italy. House-infused liquors inspire the handcrafted cocktails. CUCINA enoteca has a sister venue in Irvine.